Indonesia 3: Volcanoes, volcanoes, Bali? And so, off we went, that very next morning, on our way to Bali. It would be the longest, slowest, hardest road trip ever, but with good rewards;) And did we mention that we got our money back for our flights? 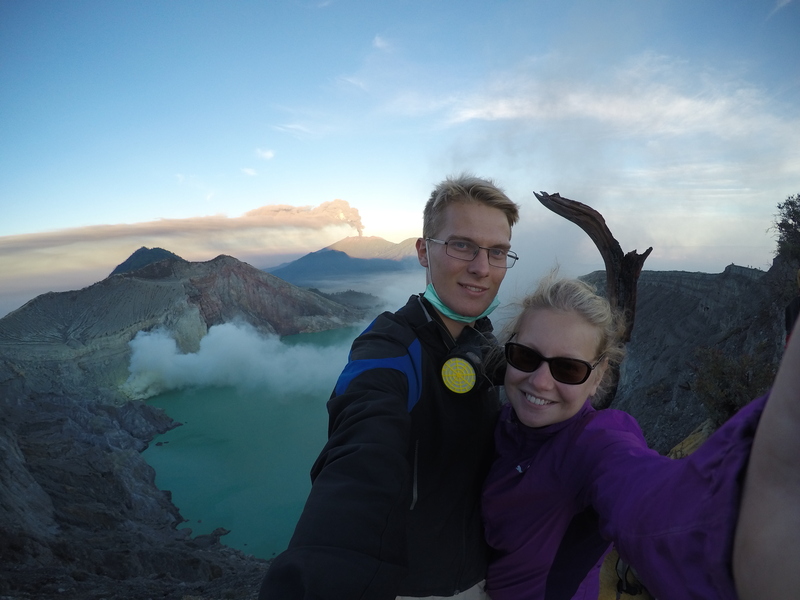 So for the same amount of money we were now climbing two volcanos ánd would arrive in Bali. Only thing is that we planned on climbing Mount Rinjani in Lombok and stay at the Gili Islands. Now it looks like that’s no longer possible. Anyway, back to the start of our trip. At 7 in the morning we we were picked up from our hotel to start our trip. However, as we had to pick up other tourists, we only left Yogja past 8. The rest of the day was spend in uncomfortable positions in a minivan. We had long breaks for lunch and when we switched cars in the night to drive up the Mount Bromo. Otherwise, it was driving, driving, driving.. Too bad that there isn’t a single highway in Indonesia, and all our roads were 1 lane local roads full of the oldest trucks you can imagine, people with no drivers license driving cars at a top speed of 25 km per hour, and a thousand scooters. As there are almost no roads besides these ones, we were in traffic DURING THE WHOLE TRIP. I kid you not, It was horrible. Our trip was only a few hundred kilometers, yet it took us 3 whole days to get to our destination. Totally crazy. Indonesia needs infrastructure, badly. Anyway, we arrived at our hotel at Mount Bromo National Park at 22.30. It was a really nice and fancy place, so we were surprised given that we had booked a pretty “cheap” tour. Lucky us! :) Our hotel was also the one most near to the actual mountain (only 1 hour of walking! ), which was great given that we had decided that we would not go with the hundreds of other tourists to watch the sunrise at a viewpoint at another mountain. 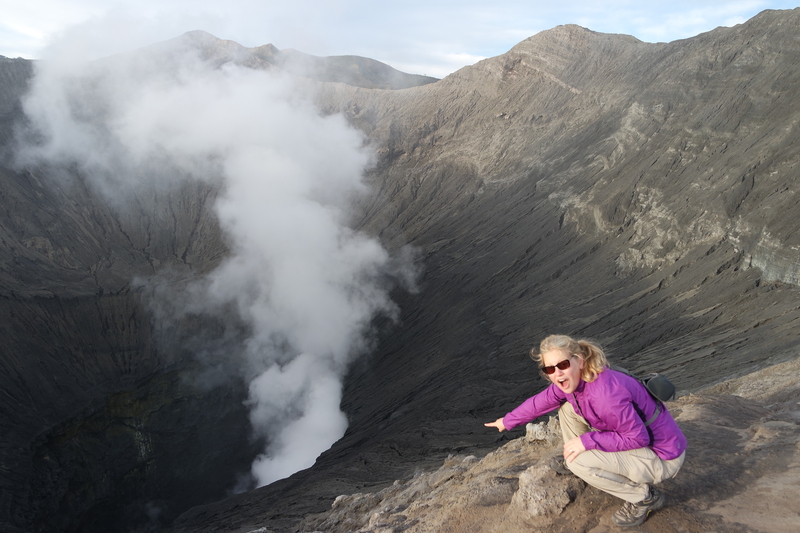 We would walk early morning (4.00) to mount Bromo, and watch the sunrise from the crater. Best decision ever. There were only a handful of other people, and we had plenty of time to take some beautiful pictures. We later heard that the others were disappointed with their decision to go somewhere else. After our early morning mount Bromo climb, we walked back and, after breakfast, got back into the van for another day of slow and uncomfortable driving. 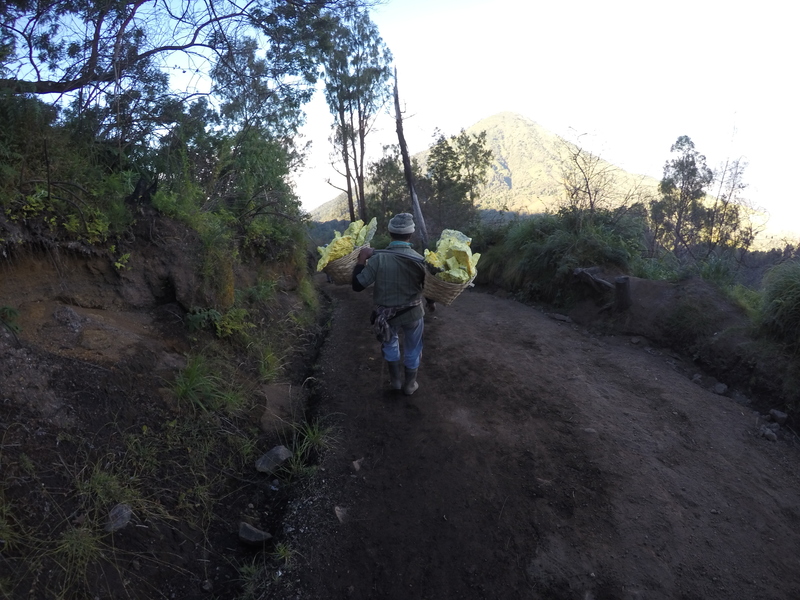 From now on only GoPro photos:( This is a worker carrying a sulphur load. 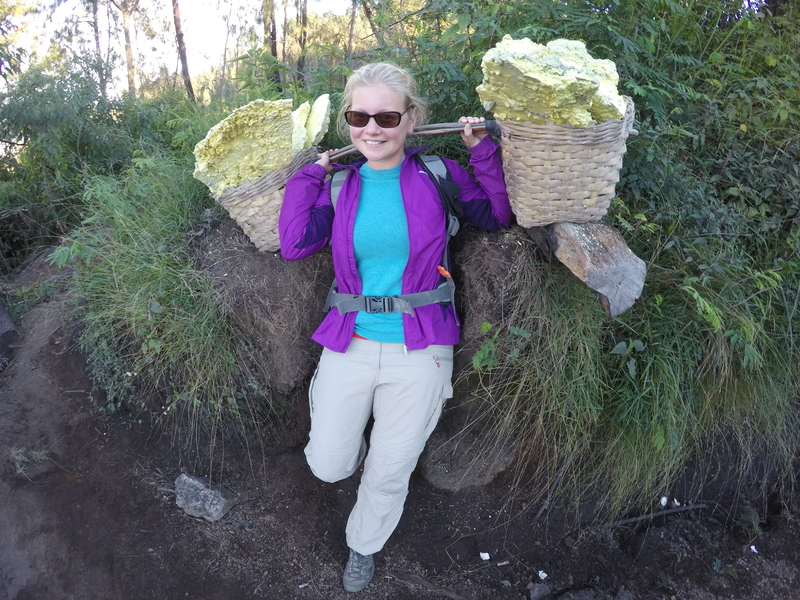 Me pretending to be able to carry such a sulphur load. So from now on, we cannot take anymore amazing photos:( Just the GoPro will have to do. Very sad, but what can you do about it… So we were at the bottom now, and you could see miners cutting out sulphur in the gases, which is deadly work. We also saw mesmerizing blue flames, which happen when the gases our burnt. It was very dangerous to stand close to the flames, which we of course did. The winds changed a lot, and thus sometimes the gases would hit us full on, and then it was impossible to breath or keep your eyes open, even with the gas mask on. So later went went a little further away. It was beautiful to see wherever you stood though. Then, we climbed back up to the crater rim, and walked around it to get a good sunrise spot. Unfortunately, it was very cloudy, so you couldn’t look into the valley. But you could now see the crater lake from above, and its crazy light blue color due to the sulphur. Also, from the crater rim in the morning light, we could see mount Raung, the stupid erupting volcano that caused our flight to be cancelled. From here, it looked pretty amazing! 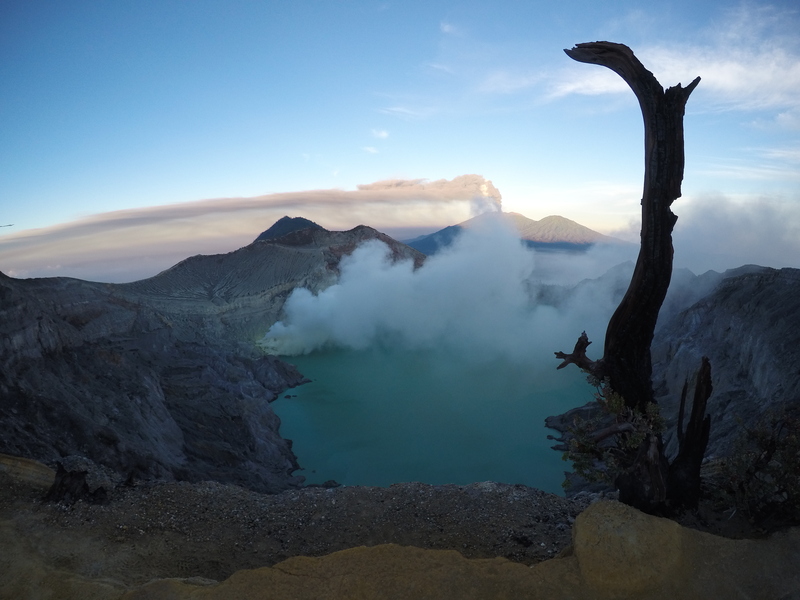 Rim of mount Ijen with a smoking mount Raung in the background. Back down again, we decided not to wait for the rest of our group, but to join another van to take us to Bali. When we arrived at the harbour, our trip was over. 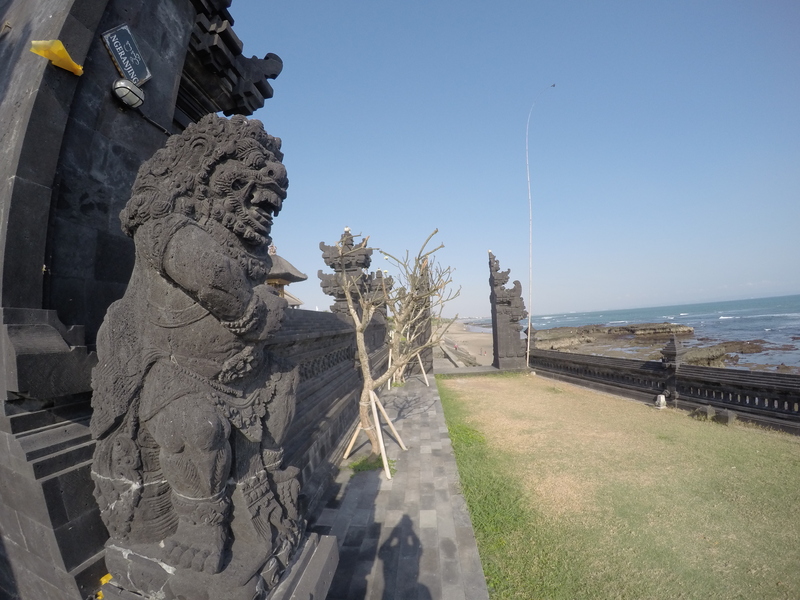 We paid a tour company there to take us to Denpasar (capital of Bali) by bus. It was a non airconditioned bus, but we thought we could make it because it looked more comfortable than the minivan at least. One hour of waiting before we could enter the ferry in that bus under the hot sun proved us wrong. We were glad when we could finally be outside the bus in the ferry. Because the ferries are also not well arranged like the rest here, we had to wait for an hour in front of the Bali harbour before we could dock. After that, the went into the bus again and were on our way to finally reaching our destination. 3 Hours later, we were finally there. As we didn’t have any plans yet for Bali, as we didn’t plan on being here at this time, we stayed in the Denpasar bus terminal with free wifi until we had chosen a place to stay. This was a good decision, as an hour later we had our accomodation and shared a taxi towards Seminyak. Seminyak is a beach town, a little more upscale and thus more quiet than its popular neighbour, Kuta. Our hotel in Seminyak was located on the main street, which was lined with gorgeous (but very expensive) shops. Fortunately, our place was very quiet. Because it was a last-minute deal, we had a crazy deal and stayed in a big hotel room with an even bigger bathroom. Perfect:) Our hotel had a pool and everything, so we planned on not doing anything but sleeping and relaxing for the coming 4 days. After all, we hadn’t had more than a few hours of sleep each night for the last 3 nights.. The next day already, we decided to go to the beach. It’s around 15 minutes walking, and the beach here has very strong currents and big waves. Ideal for surfing, but not for swimming. You can imagine what Jan-Henk did the next day..;) He even convinced me to go surfing, but with the strong currents it was very hard for a first time. Still, it was very exhilarating to try it, and I’m definitely ready to go again soon! The day after that, we were sore, and finally had a real chill day by the pool. We felt like royalty. 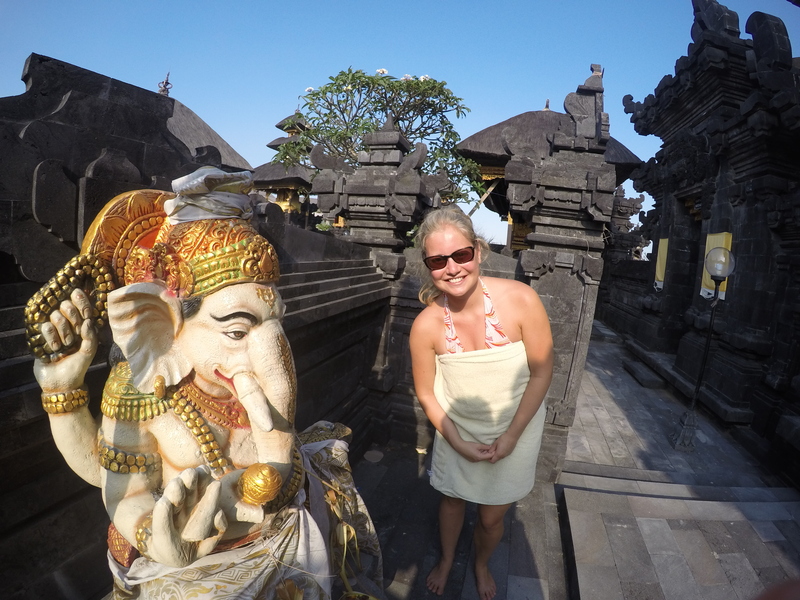 On our last day in Seminyak, we decided to walk to Tanah Lot from our hotel along the beach. It ended up being a 3.5 hour walk, and Joske’s feet were open due to all the sand scraping away the skin. But it was worth it, becaue along the way, we saw amazing things. We saw locals enjoying the sea, worshipping it, and fishing. We saw stretches of beach that had pitch black sand which reflected like diamonds. We saw a place where old coins were washed upon the shore, which we took as a souvenir. And we saw many temples scattered along the beach. 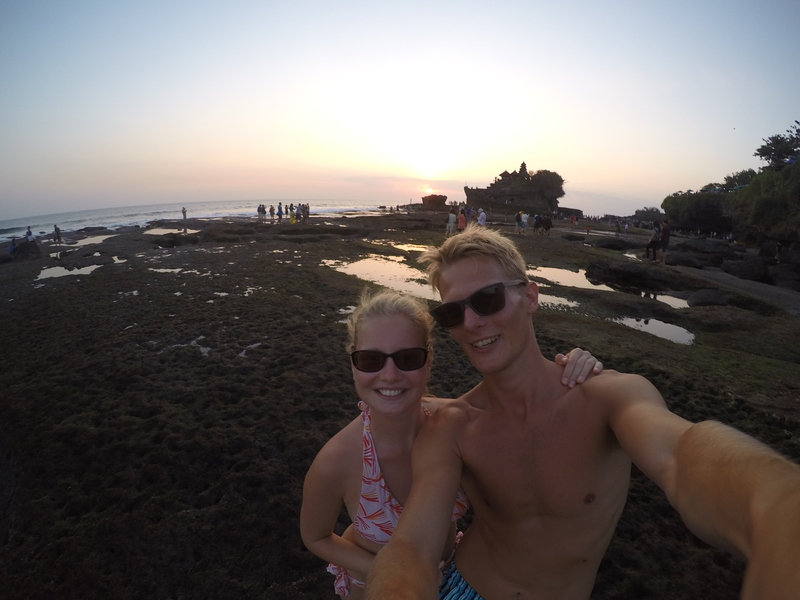 We arrived just in time at Tanah Lot to see it in the sunset. There were a lot of tourists there, but we didn’t care because we made it and had seen amazing things along the way. A temple by the sea. Visiting a temple during our beach walk. A beautiful pitch black beach with a diamond shine (and JH). After the sunset, we went and searched for a taxi back, but there were non. Apparently, everyone uses the same taxi they took to get here also to get back. After a lot of trying, we finally managed to get into a private car with friendly Aussies who would drop us off in Seminyak. Perfect. After more than an hour drive for 15 kilometers, we finally arrived near our hotel. We gave them some of the coins we found at the beach as a thank-you. Then it was already time to leave for our airport hotel, as the next morning we would take an early flight to the Komodo islands (hopefully this time no volcano ruining our plans). We will come back to Bali again after the Komodo islands, and are excited to see more of Bali later on!